High temperature conveyor furnaces are used for continuous annealing of forged parts. These furnaces are also used with their muffle to protect radiation and create a non-corrosive inert or reduced atmosphere for bright annealing, brazing etc. Generally, these furnaces work up to 1150°C, in order to create a combined inert and reduced atmosphere requirement of brazing furnace wherein nitrogen needs to filled in loading area and cooling chamber and to retain the reduced atmosphere for heating and brazing. A humpback furnace is used which will have an inclination of 1 in 20 upward graduations and 1 in 10 downward radiations in cooling chamber with a horizontal heating and brazing furnace. Generally, either cracked ammonia or pure hydrogen and nitrogen are fed into the furnace. In case of cracked ammonia, the ammonia is cracked externally and made to pass through appropriate filters to control the dew point of gas. Assembly lines with high production rates with diverse core applications have influenced Therelek to develop various furnaces. Continuous furnaces ensure controlled retention time for repeatability of metallurgical properties of the material. 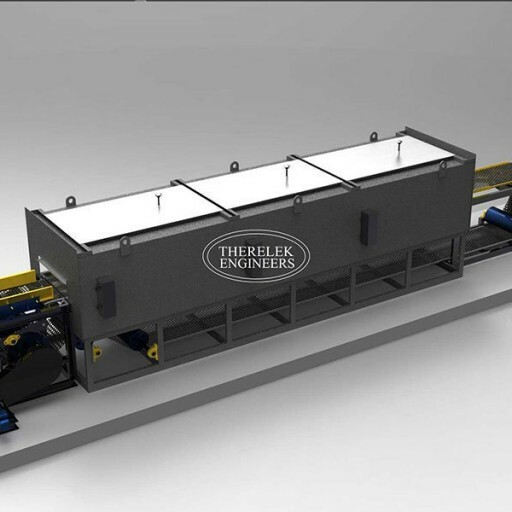 The continuous mesh belt furnace is primarily used to process relatively thin sheet metal stampings that become distorted when loaded directly onto a belt. The feeding of the automated parts is made continuous with the help of specialized conveyor feeders. These feeders strip the parts that tend to tangle from one end in the feeding area and carry them up to a vibratory trough. The trough in turn feeds the material and enters the furnace. Larger furnaces of this type have burners both inside and outside walls above the hearth. In case of very large furnaces, we use multiple heating zones that can be fired either with roof type burners or burners with vertical portion of saw tooth roof construction. These furnaces are similar to roller hearth furnaces, except that mesh belts or conveyor chain are used to move the material. These furnaces are preferred for small material that cannot be moved directly or rollers. The material is fed automatically onto a mesh belt at the front of the furnace having a liquid or gas atmosphere seal to maintain atmosphere integrity in the furnace chamber.